Here we go again with another excellent book in the Images of War series from Pen & Sword. 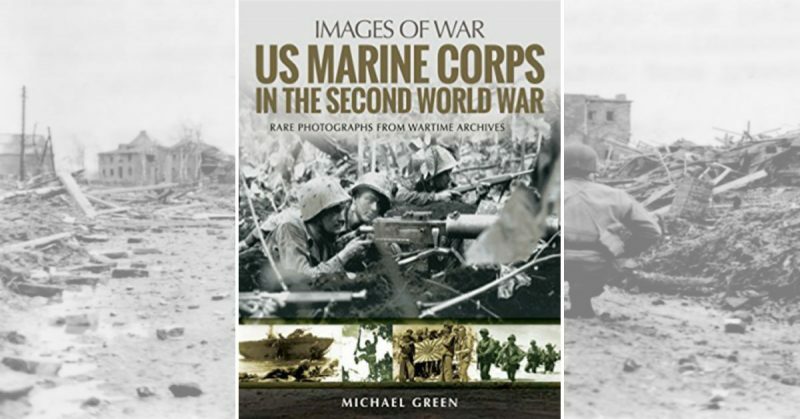 This time round the prolific Michael Green has turned his attention to the activities of the United States Marine Corps during World War II. Right from the off it is clear that the appearance of this book is deceptive because this is actually a substantial piece of work that underlines the flexibility of this range of books. For someone like myself, who would consider his knowledge of the Pacific War to be low to moderate, this book offers the perfect opportunity to firm up on events and get them into context. I am guilty of being largely Eurocentric in my historical interests purely because of physical geography and this book has encouraged me to expand my horizons. I come from that age group who saw the classic war movies on television at a time when they were shown almost constantly at weekends on the BBC and the John Wayne stuff and others became my currency for the Pacific War. I’ve neglected the history in a big way because I find the fate of prisoners of war in Japanese hands to be really depressing and a visit to a couple of war cemeteries in Hong Kong underscores this. 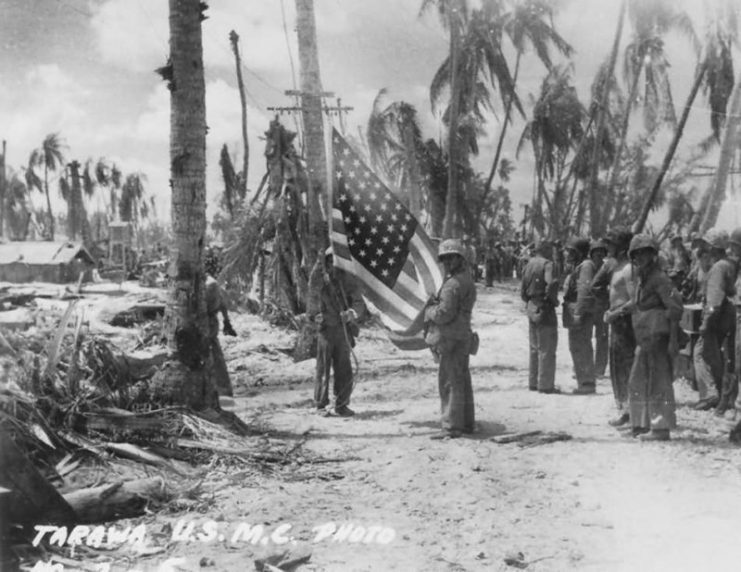 But, of course, there was so much more to the campaigns of the Pacific War where dogged determination, endurance and a great deal of courage gave the United States, in particular, a final victory we must honor forever. 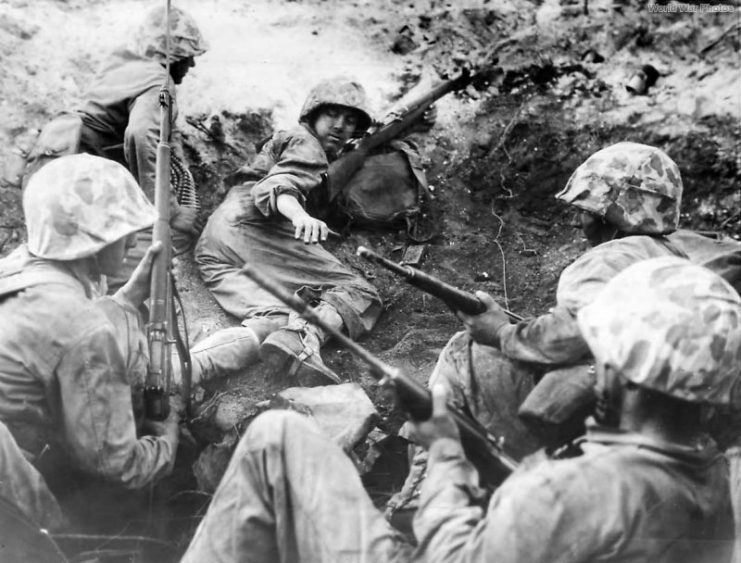 1st Battalion 24th Marines in action on Namur during the Pacific War. 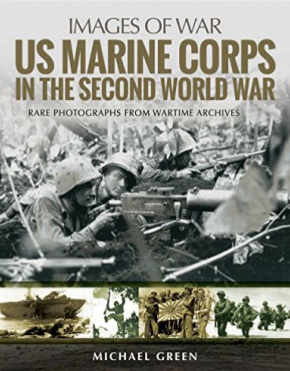 Mr. Green’s book gives us a look at the immense contribution to that final victory made by the US Marine Corps. They faced some eye-watering challenges and paid a high price for success. The author has selected the photographs with great care and the effect is to present a balanced collection that tells the story really well. Mr. Green does not shy away from showing images of American dead and this helps to underline the sacrifices made. 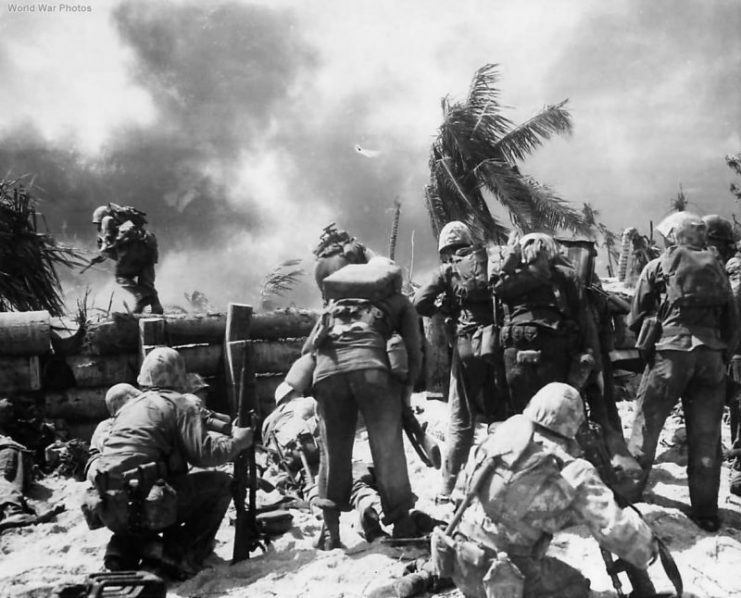 Marines storm Japanese held airport on Tarawa. 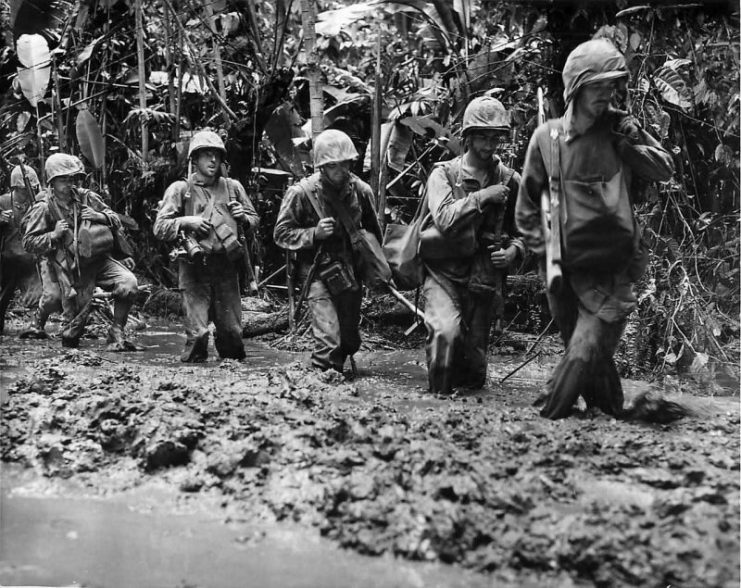 The reader is given the fullest impression of the range of conditions marines had to live and fight in along with the defences they were up against. We are never left in doubt of how resolute the Japanese were. For me, the package wins because all the images fit the story and there is no suggestion of showboating with dramatic or gory photos used for their own sake. There is more than enough to catch our attention, nonetheless, and, as usual with this range, there are plenty of shots that will appeal to living history buffs and model makers. 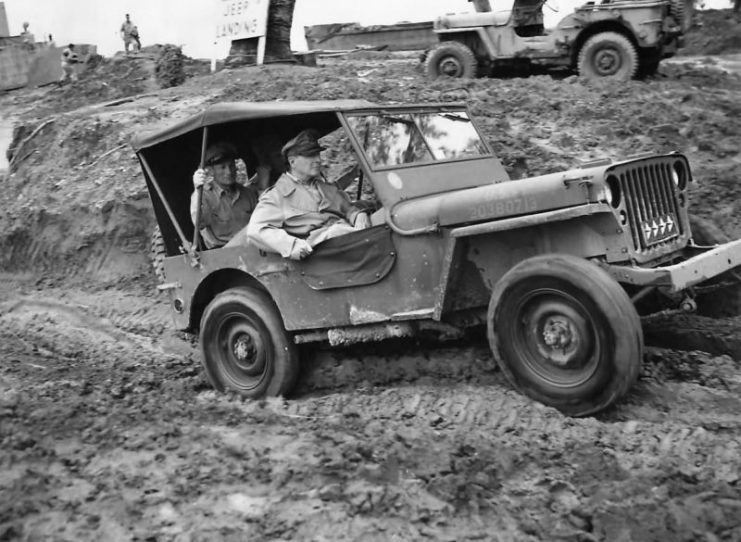 Gen MacArthur riding in Jeep at Jeep Landing on Leyte 1944. One thing I did appreciate were the appearance of a number of senior officers who conducted operations. They come across as a tough bunch of blokes who knew their stuff, but, as ever, there were winners and losers within the group of commanders. I am a lover of the Sherman tank and the images showing them with all manner of add on protection offer something very different from tanks operating in the European campaigns. There isn’t a duff picture in this book. 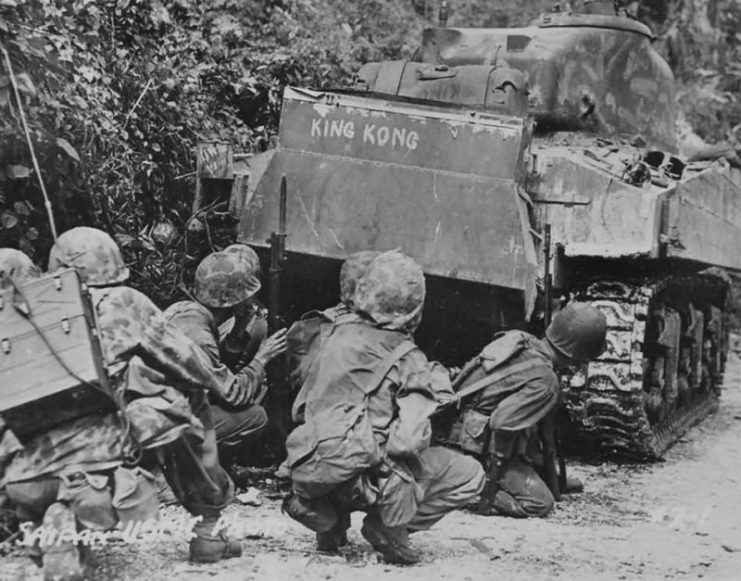 Marines take cover behind a M4A2 Sherman named King Kong – Saipan July 8, 1944. Tank of the Company C, 4th Tank Battalion. The reproduction quality throughout is outstanding and this, too, helps to emphasise my opening comment about the substantial feel of the end product. Michael Green has produced a fair number of excellent reads for this series of books in addition to his other work and I think this volume should be considered to be one of the best. For a cover price of just under $23, which you will no doubt find even cheaper from the usual outlets, this book offers a succinct and impressive window on the Pacific War you will be hard pressed to match elsewhere. For that kind of money you really can’t go wrong and this is why I continue to recommend this range, especially to military history newbies finding their feet in a world where there are so many books on just about any facet. I’ve come away having learned stuff and the images are wonderful in their own right.